Really, I don't think I can continue to support comics like this. 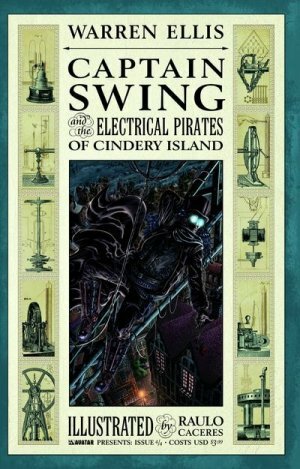 Captain Swing, a four-issue mini-series, started in February 2010. The second issue came out in July 2010, the third, March 2011, and now the series finishes at the end of October 2011. With so much time between issues, along with the requisite difficulty of remembering what was happening, comes an expectation of greatness. I mean, if a writer and artist have to spend seven months on a 22 (or so) page comic, it should be pretty awesome, right? Instead, this falls pretty flat. 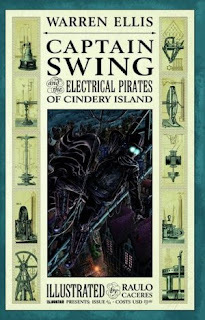 Granted, I don't really remember what was going on, and I definitely don't much care about this cop who is now using Captain Swing's electrical flying pirate ship to wreck justice on the magistrate that had someone shoot up Cindery Island last issue. Actually, at this point, I don't care about any of it, especially the cutesy silent movie card that takes up a whole page unnecessarily. I would never suggest that Warren Ellis has lost his touch - read his Secret Avengers and Freakangels. I just want to suggest that if he's going to treat his Avatar mini-series as complete afterthoughts, to be worked on whenever and half-assedly, he should not expect me to keep paying $4 per issue for it.